Changing Woman's [asdzáán nádleehé] twin sons [the twin war gods] had been born for the purpose of ridding the earth of the Monsters who were killing all the people. When the boys were grown, a matter of 12 days, they told their mother that they wanted to visit their father. Changing Woman [asdzáán nádleehé] tried to discourage them, not properly identifying their father, and when that failed, telling them how dangerous this trip would be, how many guardians there were at his house, how he was without mercy. But they also got advice from others, such as the Arrow People, and Wind's Child [nich'i biyázhí] has been placed at their earfolds to advise them at all times. They overcame many hazards on their trip to their father's house and were given a white shell [yoo gaii] prayer [sodizin] plume by dawn [hayíí ká] to use to protect themselves when they were in the Sun's [Jóhonaa'éí] house. They also received advice from Father Sky, Hornworm, Water Sprinkler and Spider Man. The twins then moved along the top of a rainbow [náás'íílid] to the house of their father, the Sun [Jóhonaa'éí]. In the Sun's [Jóhonaa'éí] house, they underwent many trials to prove to the Sun [Jóhonaa'éí] that they were indeed his sons. The white shell [yoo gaii] prayer [sodizin] plume was essential for their survival during these tests. But, in the end, the Sun [Jóhonaa'éí] accepted them as his sons, clothed the older in turquoise [doot 'izhii] and the younger in white shell [yoo gaii], and inquired of them why it was they came to see him. He opened doors in each of the cardinal directions, doors of turquoise [doot 'izhii], white shell [yoo gaii], abalone [diichi i] and jet [bááshzhinii], offering the boys jewels, livestock and game, plants and beautiful flowers, rain and rainbows [náás'íílid], but Wind's Child [ni ch'i biyázhí] at their earfolds, advised them to answer each time, "We did not come for that, my father; that is not our purpose in being here." Then Wind's Child [ni ch'i biyázhí] told them to say, "We two came for the pair of zigzag lightning that lie up there, and flint shoes, flint clubs, flint leggings, flint garmets, flint headgear, flint wristguards, these we two came for. On account of the monsters there is just about one person left." The Sun [Jóhonaa'éí] answered them slowly, telling them that they are brothers to the monsters they wish to kill, but that that is apparently no more. He then placed agate in them, making them immune to injury and gave them the garments and weapons they had asked for; the older got dark flint and the younger blue flint garments. The Sun [Jóhonaa'éí] gave them prayersticks and then told them that the younger of the two (Born for Water) would sit watching these prayersticks while the older (Monster Slayer) went out to kill the monsters. If these prayersticks began to burn, this would signal that his brother was in danger and that he should go to him to help. He then took them to the sky opening, just over Mt. Taylor, and told them where to find Big God [Yé'iitsoh]. Wind's Child [ni ch'i biyázhí] then took word over to Hesperus Peak, to Yellow Wind, to spread the word that they were returning. The Sun [Jóhonaa'éí] placed the older one at the tip of a zigzag lightning and shot him to the center of Hot Spring, the home of Yé'iitsoh. He placed the younger on on the tip of straight lightning and shot him to the center of Hot Spring. There they waited for Yé'iitsoh to come for water, as he did everyday, exactly at noon. Each day he drank all of the water. When Yé'iitsoh arrived, he approached from each direction, a little closer each time, inspecting the vicinity of the spring. He saw no one as the twins were concealed by a dark cloud. After the fourth time he came all the way to the spring and began to drink. When almost all of the water was gone, when Yé'iitsoh was drinking for the fourth time, Wind's Childs [ni ch'i biyázhí] told them to step out and make themselves known. They left the dark cloud and walked into plain sight where Yé'iitsoh saw them when he looked up. Then they exchanged taunts. Yé'iitsoh threw flint clubs at them, missing each time because Wind's Child [ni ch'i biyázhí] was whispering advice in their ears. The spinning club he threw cut a path through the trees and stones, making a barren strip. Then Yé'iitsoh had no more weapons. At that point a big storm began and Yé'iitsoh was wrapped in zigzag lightning. This lightning stripped off his flint armor. Wind's Child [ni ch'i biyázhí] told the twins that this was their time now and to shoot into the sole of Yé'iitsoh's foot. Monster Slayer used one of his zigzag lightning arrows to do this. He then shot a straight lightning into Yé'iitsoh's hip, which brought Yé'iitsoh to his knees, but he rose. Monster Slayer then shot a zigzag lightning into the small of Yé'iitsoh's back. He fell to his knees but rose yet again. Then Monster Slayer shot a straight lightning arrow into the back of Yé'iitsoh's head. This time Yé'iitsoh fell. At some distance away, from a place called Open-Mouth Bear, blood came pouring out. Yé'iitsoh had hidden his heart, nerves and breath there. The blood from the body and from the distant place moved toward each other. Wind's Childs [ni ch'i biyázhí] pointed out that, should these streams meet, Yé'iitsoh would come to life again/ Monster Slayer immediately drew a zigzag line with his club between the streams, while giving his call, ha ha; Born for Water drew a straight line between the streams with his club while giving his call, ha ha ha. Then they repeated these actions and the blood stopped flowing there. The earth trembled and sounds filled the sky. The blood turned to the lava seen around Mt. Taylor today. Monster Slayer removed the scalp of Yé'iitsoh and the two were overcome by the vapors from the body. They helped each other stagger over to a juniper where they recovered by chewing some of the juniper. When they returned home, after an absence of only four days, they needed to convince their mother, Changing Woman [asdzáán nádleehé] , that they had actually been successful in killing Yé'iitsoh. She then danced outside with Yé'iitsoh's scalp between her teeth. After killing Yé'iitsoh the twins were eager to continue their mission to rid the world of the monsters that were decimating the People. The next day they left to kill the Horned Monster [Déélgééd] who lived in the Jemez Mountains. As a by-product of this second success, chipmunk acquired his stripes when he was striped by the blood of the dead monster. Their third challenge was to kill the Rock Monster Eagle [Tsé nináhálééh] who would swoop down and carry the People off to feed the nestlings on top of Shiprock [Tsé Bit'a'í]. As the sun was coming up, Monster Slayer [Naayéé neizghání] ran along the top of the Continental Divide with the colon of Horned Monster [Déélgééd], filled with blood, around his neck and the small intestines folded over his shoulders. He was seen by the Rock Monster Eagle [Tsé nináhálééh] who began flying toward him. He sang out, saying that he was Monster Slayer [Naayéé neizghání] and was coming to kill the monster. As the Rock Monster Eagle [Tsé nináhálééh] flew over and past him, Wind's Child [ni ch'i biyázhí] whispered in his ear to allow the monster to pick him up. Monster Slayer [Naayéé neizghání] was carried to the top of Tsé Bit'a'í and thrown against the sharp rock which was black with the blood of the People. Monster Slayer [Naayéé neizghání] used his flint club to deflect his path and to avoid harm. He used some of the blood with which he had filled the intestines that he carried around his neck to create the appearance of great bleeding. The two children of the Monster rushed out from their cave to get their food. Their father flew off to find another victim. Monster Slayer [Naayéé neizghání] arose and asked the two children of Rock Monster Eagle [Tsé nináhálééh] what time their father usually returned. They replied that he returned at exactly noon and that male rain began over at Mountain-which-lies-elevated (the Lukachukai Mountains) (to the west) at about that time. He then asked when their mother would return. They said that she would return when the Sun [Jóhonaa'éí] began to drop a little and female rain began at Beautiful Mountain. Monster Slayer [Naayéé neizghání] then built a lookout on the east side of Tsé Bit'a'í from the rock there. Exactly at noon a dark cloud appeared at Mountain-which-lies-elevated (the Lukachukai Mountains) from which zig-zag lightning could be seen. 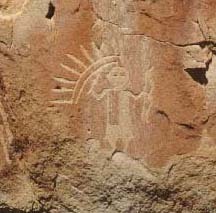 Soon the Rock Monster Eagle [Tsé nináhálééh] appeared with a young Diné man and threw him to the rock where he lay motionless. When Rock Monster Eagle [Tsé nináhálééh] landed on Tsé Bit'a'í [Ship Rock], Monster Slayer [Naayéé neizghání] shot it with a zig-zag lightning arrow. The monster fell off and there was a tremendous earthquake. The children of the monster began running about crying. Monster Slayer [Naayéé neizghání] told them to be quiet and to go sit down, which they did. When the Sun [Jóhonaa'éí] had dropped slightly, a dark mist appeared at Beautiful Mountain with many rainbows. Shortly the female Rock Monster Eagle [Tsé nináhálééh] returned with a young Diné female and threw her to the rock where she lay motionless. Monster Slayer [Naayéé neizghání] then killed this monster as she was still settling onto Tsé Bit'a'í. Another earthquake ensued. Monster Slayer [Naayéé neizghání] then called the two children of the monster out and told them he was going to kill them now. They pleaded with him, four times. He told them that if they ever thought in wicked ways again, he would certainly kill them. He then removed the tongue of the older child and replaced it, reversed, saying, "From this day on be sure to remember the things you two have promised about yourselves! In days to come, when earth surface people come into being, they will make use of you." He motioned him to the east, to the south, to the west and to the north, and then released him to the east. The bird flew in the sunwise circle four times and called out sag sag and then left. This bird became the golden eagle. Earth surface people still, to this day, find his down, tail and wing feathers useful. Monster Slayer [Naayéé neizghání] then took the younger one and also pulled out his tongue and reversed it. He spoke to it saying, "As for you, you shall provide prophecy for the earth surface people. Sometimes you shall speak the truth, and sometimes you shall lie. It will be for men to decide what is true and what is false. That way they shall learn from you how to tell the difference between wisdom and folly." Then he motioned with him in the same way and then released him in the direction of the La Plata Mountains to live in Big Rock Cave. This bird became the owl. He called out "Uwuu! Uwuu! as he flew away. Monster Slayer [Naayéé neizghání] then walked around the top of Tsé Bit'a'í and saw no way to get down. He walked around four times in a circle and found no hope. He began to worry, but Wind's Childs [ni ch'i biyázhí] spoke into his ear as usual, saying, "Don't be thinking like that! You should realize that word has been sent out to places." Again Monster Slayer [Naayéé neizghání] walked over to the edge and looked down. Before he was certain that no one was there, but this time he saw a head sticking out from behind a rock. This was Bat Woman [Jaa'abaní asdzáá]. He said, "My grandmother, carry me down!" Four times he asked. She then began to come up the rock toward Monster Slayer [Naayéé neizghání]. She said, "You must not look at me, my grandchild! I am starting up there, you must not look at a person, that must absolutely not be done!" She began to approach along the rock, singing, "I am the one that clings, clings, clings." She had carried her headbag up, suspended by strands of strong spider web. She told Monster Slayer [Naayéé neizghání] to climb into her headbag and to close his eyes and not open them before they reached the ground. Several times Monster Slayer [Naayéé neizghání] opened his eyes and each time he began falling rapidly. Bat Woman [Jaa'abaní asdzáá] scolded him severely each time. When he reclosed his eyes, their slow descent resumed. In this way, they reached the valley floor. They were right beside a large ridge-like wingbone from one of the monsters. Monster Slayer [Naayéé neizghání] used his flint club to extract the hearts of the two monsters. Then he cut out wing feathers to give to Bat Woman [Jaa'abaní asdzáá] and some tail feathers from the center of the tail. Her headbag was filled with the feathers. Monster Slayer [Naayéé neizghání] warned her not to take the feathers by the yellow sunflower patch, but to stay beside it, but she turned in there, into the forbidden sunflower patch. A flock of small gray birds swarmed out of her basket, many kinds of small birds, When they were gone, so were the wing feathers. In this way, the small birds were created. "Those who wish to be obeyed should also obey!" cried Monster Slayer [Naayéé neizghání]. Only the tail feathers were left, which she sat down on. A jackrabbit came along and asked her what she was sitting on. She replied, "Nothing my grandchild, it is just that I am sitting on something pretty, I suppose." "Let me see them," he said. "Let me look at them." When he repeated this four times, she finally gave them to him, and he dashed away with them and stuck them to the side of his head where they are now his ears. Monster Slayer [Naayéé neizghání] then packed the hearts of the monsters back to Huerfano Mountain [Dzi ná'oodi ii] and told his mother Changing Woman [asdzáán nádleehé]that he had killed Rock Monster Eagle [Tsé nináhálééh]. Again he had to convince her of his success by showing her the hearts. She again danced outside with the hearts between her teeth to mock the monsters and to rejoice. This discussion is based on the River Junction Curly version of the Blessingway story as found in Blessingway by Leland C. Wyman © 1970 Leland C. Wyman, University of Arizona Press; and Diné bahané by Paul G. Zolbrod © 1984 Paul G. Zolbrod, University of New Mexico Press. Popular legend also has it that one of the monster's blood droplets spilled on the ground and became [Arizona Chrome Pyrope] "Ant Hill Garnets" and the carcasses of the monsters are now the rock formations that is now called Monument Valley. Click Here for yet another rendition of the story of the Twin War Gods, Monster Slayer and his brother Child Born of Water.